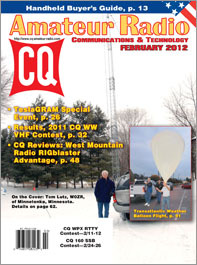 This February marks the fifth anniversary of the end of all code testing for amateur radio licenses in the United States, and the February issue of CQ starts out with an assessment of the impact of that change in Editor Rich Moseson, W2VU's, "Zero Bias" editorial. 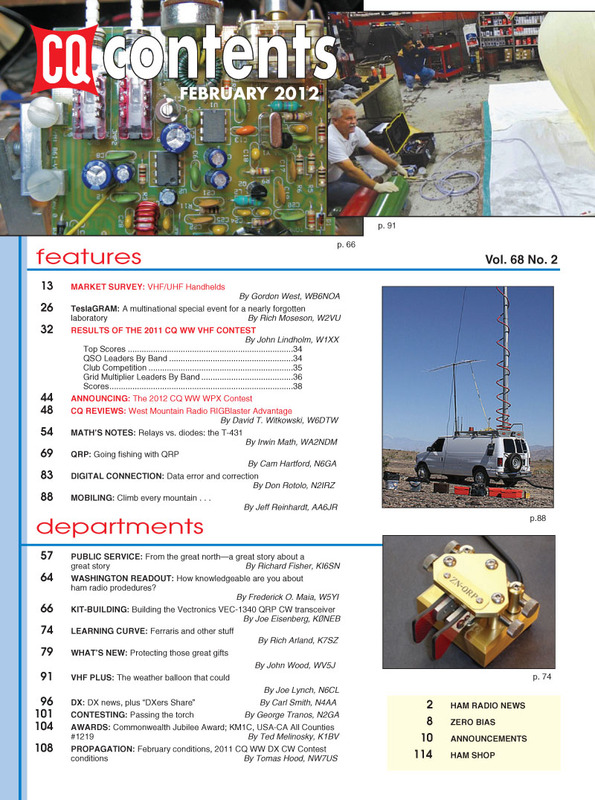 February is also our annual CQ Market Survey issue, and this year, Contributing Editor Gordon West, WB6NOA, covers the VHF/UHF handheld marketplace, including a look at how established manufacturers are responding to the influx of inexpensive HTs from China. Next, Editor W2VU takes us with him on a trip to operate a special event station that was part of an international effort to raise awareness of Nikola Tesla's last laboratory and attempts to save it. We've also got the results of the 2011 CQ World Wide VHF Contest, the only truly worldwide VHF contest, marked this year by new record scores in Europe and Asia. We also have the rules for the 2012 CQ WW WPX Contest, with the SSB weekend coming up on March 24-25, and the CW weekend on May 26-27. You can also link directly to the rules right here. Next, David Witkowski, W6DTW, brings us a CQ Review of the West Mountain Radio RIGblaster Advantage, as well as a web-only "Digging Deeper" piece on the benefits of a separate sound card for digital modes. Among our columns this month, "Math's Notes" editor Irwin Math, WA2NDM, looks at relays versus diodes, with a special focus on the TL-431 shunt regulator, which he describes as more of an adjustable Zener diode. 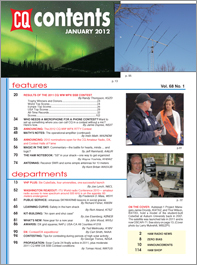 Public Service Editor Richard Fisher, KI6SN, reports on a great newspaper website story about ham radio public service in Alaska, and "Washington Readout" editor Fred Maia, W5YI, has a quiz for you on how well you know your ham radio procedures. Kit-Building editor Joe Eisenberg, K0NEB, writes about his experiences in building the Vectronics VEC-1340 QRP CW transceiver; QRP Editor Cam Hartford, N6GA, looks at using propagation prediction programs in "Going Fishing with QRP," and "Learning Curve" editor Rich Arland, K7SZ, talks about "Ferraris and Other Stuff." (What's that got to do with ham radio? You'll just have to wait and read the issue!) New Products Editor John Wood, WV5J, looks at bags and pouches to protect any new gear you may have gotten over the holidays; Digital Editor Don Rotolo, N2IRZ, covers data error detection and correction, and Mobiling Editor Jeff Reinhardt, AA6JR, profiles one California ham who takes "hilltopping" to an extreme. "VHF Plus" editor Joe Lynch, N6CL, describes the historic transatlantic ham radio weather balloon flight launched by K6RPT - it flew from California to the Mediterranean before returning to earth! DX Editor Carl Smith, N4AA, reviews the top DXpeditions of 2011 and shares a short essay by "Uncle DX" called "DXers Share." Contesting Editor George Tranos, N2GA, looks at continuing the contesting tradition by mentoring of new contesters by old-timers; Awards Editor Ted Melinosky, K1BV, looks at the UK's Commonwealth Jubilee Award, and Propagation Editor Tomas Hood, NW7US, looks at expected conditions on the bands in this February as Cycle 24 finally starts to heat up. That's a brief look at what's coming up in the February issue of CQ magazine, which should be on newsstands, in subscribers' mailboxes and in digital subscribers' in-boxes by February 1. 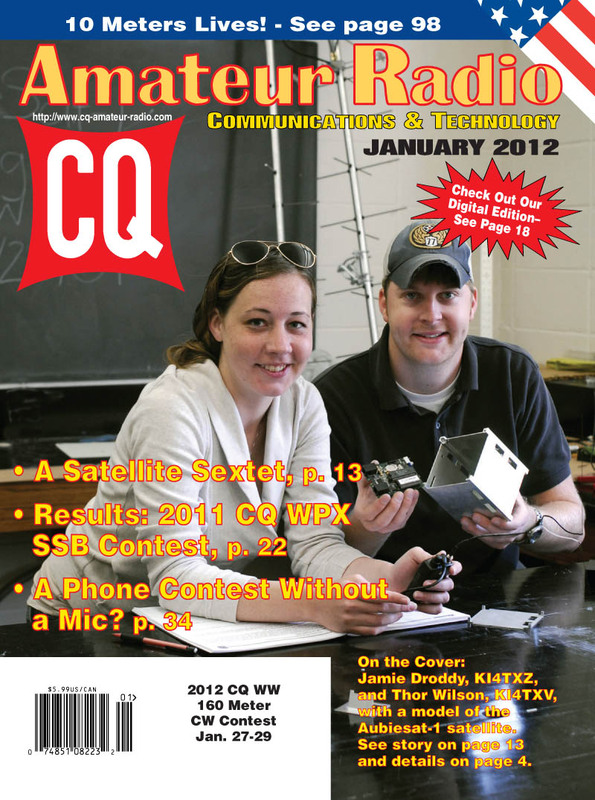 For information on subscribing to either CQ's print or digital editions (or both! ), click here! On the Cover: Tom Lutz, W0ZR, of Minnetonka, Minnesota (Cover photo by Larry Mulvehill, WB2ZPI). Inset: The Weather Balloon that Could … and Did!